Alleged offenders’ vehicle in a rash of pellet gun damage to car windows in which two juvenile offenders shot out car windows. 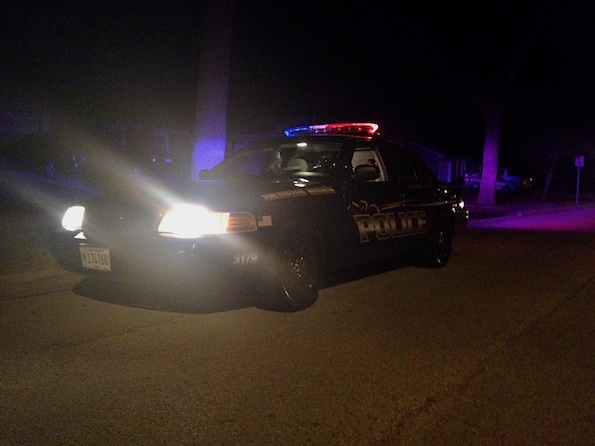 Arlington Heights police responded about 11:29 PM Thursday to a report of criminal damage to vehicle that “just occurred” in the 2400 block of North Verde. Police received a report from a resident that offenders were shooting BB guns out of a small red SUV as the vehicle was headed southbound on Verde. Police intercepted a vehicle by 11:43 p.m. on Kennicott Avenue heading southbound that matched the description of the offenders’ vehicle. Police stopped the vehicle and after investigation detained the male juvenile driver, and another subject after finding him at a residence. Both subjects were transported in custody to Arlington Heights Police Department Headquarters. 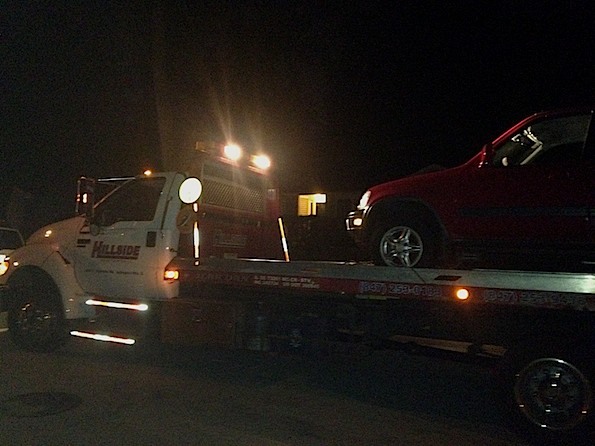 The suspects’ vehicle — a red Honda pilot — was intercepted by police and towed to a police holding area as the suspects were transported in custody to Arlington Heights Police Department Headquarters. Police prepare to tow the suspects’ vehicle while other police investigate the suspects in a rash of criminal damage to vehicles with pellet gun shots. Arlington Heights detectives started work immediately to investigate whether there was a connection with multiple recent criminal vehicle damage reported in the past week(s), especially the time period from Saturday, July 28, 2012 at 10:00 p.m. through Sunday, July 29, 2012 at 7 a.m..
Arlington Heights police received a report about 9:08 AM on Sunday, July 29, 2012 of criminal damage to vehicle in the 1300 block of North Kennicott Avenue. 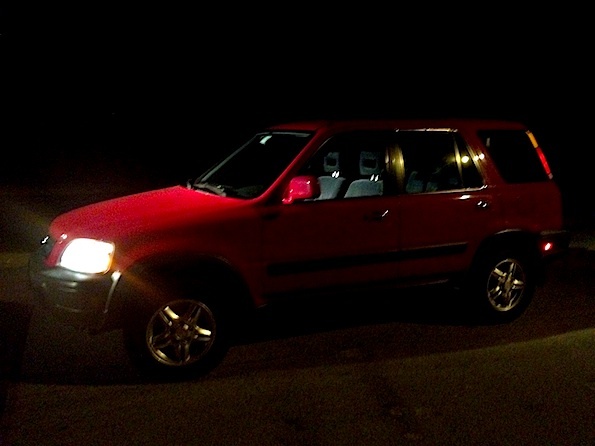 Police received a second report that a window was broken on a gray Toyota Forerunner. A second vehicle window was reported broken in the 2300 block of Verde. Eventually four total vehicles were discovered damaged on Kennicott — damage apparently caused by a pellet gun. Shattered windows were discovered on a 2007 Kia Rondo rear hatch, a white 2011 Toyota 4Runner’s rear hatch, a beige 2008 Chrysler Aspen’s rear hatch, and small dents were discovered on a black 2003 Dodge Ram. On the 900 block of East Valley Lane, a blue 2008 Toyota Prius driver window and a blue Ford Freestar rear window was discovered shattered. 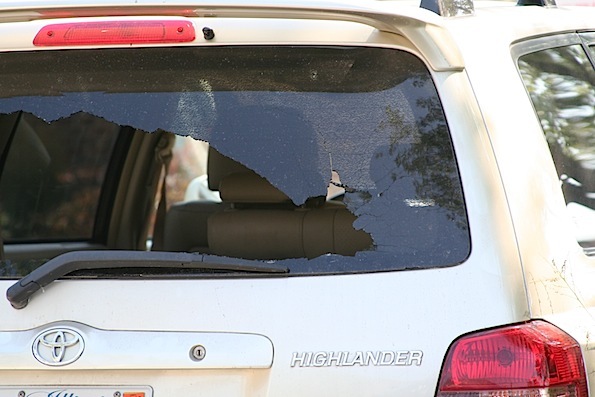 At least three more vehicles were reported with windows shattered this Friday morning, August 3, 2012. A Toyota Highlander and a Honda Odyssey were discovered with rear windows shot out in the 1500 block of North Evergreen Avenue. At least one other vehicle was discovered with a shattered window near Greenbrier School. Shattered rear window of Toyota Highlander hit by pellet gun on North Evergreen Avenue. 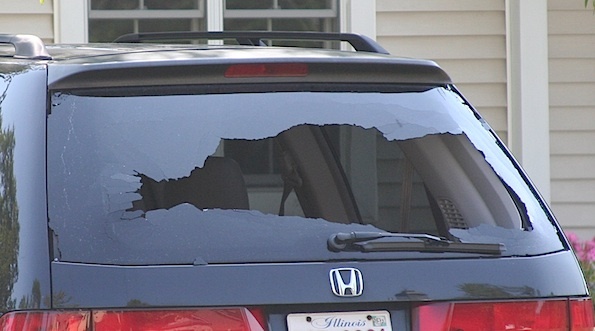 Shattered rear window of Honda Odyssey hit by pellet gun on North Evergreen Avenue.